Well-appointed rooms with microwaves and free Wi-Fi await at the Quality Inn & Suites Hinton where breakfast is free and a heated indoor pool keeps the chills at bay.This mid-rise property's 70 rooms all come with free Wi-Fi coffeemakers microwaves and mini-fridges as well as flat-panel TVs; some rooms include sofa beds too. A free breakfast gets guests charged up for a day in the Great White North. There's a heated indoor pool and a hot tub for relaxation after a hard day of work or traveling and the on-site fitness center will appeal to active types. Pets are allowed for a fee; parking is free. 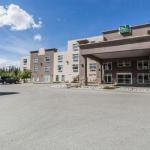 The hotel is on the Trans Canada (Yellowhead) Highway a three-minute walk from Parks West Mall and a half-mile from numerous riverside trails and parks along the gorgeous Athabasca River. Alberta's Jasper National Park with tons of wildlife and mountain views is 15 minutes away by car. The Alberta Forest Service Museum three miles away in downtown Hinton celebrates the efforts of those who maintain Canada's pristine wilderness. Edmonton International Airport is 200 miles east.